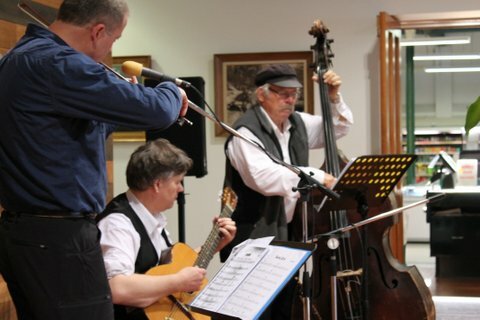 Gypsy Jam is a Wairarapa based trio specialising in Jean ‘Django’ Reinhardt and Stéphane Grappelli -style French Gypsy music. German born and now based in Masterton, Stephan Schulz plays violin and recorder. A versatile musician, Stephan has previously performed with Irish group Black Nag, pop/jazz band Blackberry Jam, and Rock/pop/folk revue Grafia. Stephan is a music teacher at a Masterton secondary school. Masterton teacher Stephen Judd features on guitar and vocals. Stephen also formed part of Blackberry Jam who performed at the 2015 Palmerston North Jazz Festival. Completing Gypsy Jam is double bass player Miles Reay. Miles is most well known as a member of the Hamilton County Bluegrass Band, but has also played in pop, country, folk and jazz groups. 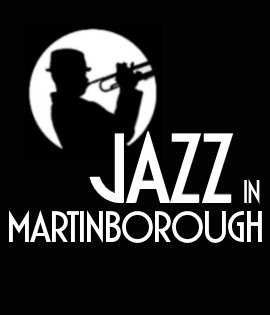 His own group, The Not That Miles jazz trio, performed at the 2013 and 2014 Martinborough Jazz Festivals. Gypsy Jam performed at the 2015 Martinborough Jazz Festival, and in 2016 at Brodie Estate Summer Vineyard Live Music Gig Series, the Manawatu Jazz Club, and the Manawatu Jazz Festival. They are currently preparing to record their second CD.